9:05 am, 23 August, 2015 р.
Heres an idea. There is a modern swiss cross bow, the twin bow II, with its upgraded string configuration, the six pack riser, its very clever. The Chinese and the Romans used to experiment with different and multiple bow configurations to maximize power. 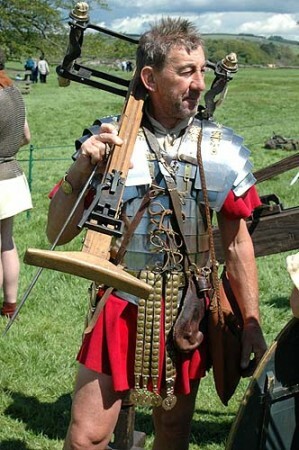 There were also many ways to use leverage for cocking and automatic reloading. What if you, as a modern Archimedes, were to build your own dream machine, something that never actually existed before, using all your knowledge and experience. They say experience is what you get when you didn’t get what you wanted. Having it now can streamline a build. I like the idea of adding another red parabola. A sense of purpose is imperative to a well rounded life.You might have to break some rules, but whose rules? You have access to modern materials and the skills to use them, and like you said, you accomplished the archeology thing, pretty much with Firefly. Maybe you could retrofit some of those braces mentioned in the new findings. The machine in the photo doesn’t look finished yet. Hope you are safe from the fires we see in the news. 11:04 am, 23 August, 2015 р. Yes, safe from the fires for now. The smoke is a real cougher though. As for a manuballista sized contraption, my personal conceit that this is still an “experimental archaeology” project will probably hold sway in the future. Nothing is so obsolete as an obsolete weapon system. There has always been an aspect of parody in my catapult work. It’s a bit like when I hear German being spoken, it just makes me want to laugh somehow. All very puerile I’m sure. Apparently my sense of purpose needs a bit of tilt to keep it going and EA provides that. I think i’ll start reviewing the artifacts that have been found of smaller iron framers. 12:14 am, 25 August, 2015 р.
I don’t know what your local conditions are but the news is alarming. When its really hot and theres no air conditioning, like if the powers out or something, there is a way to keep your self, pets and loved ones cool. Put three or four gallons of water in an air mattress, no air at all, put that under a sheet on a bed. Its how I sleep in TX off grid when it’s hot and I do it for our older dogs in heat waves. For human bodies at 98.6 degrees, 96 degree water feels cool, yet 90 degree air feels warm. Its why water beds had to have heaters. 12:33 am, 25 August, 2015 р. Thank you Charles, what a good idea. It may come to that, but not yet I think…not just yet.